Coastal cycle route, mainly along roads, between Paekakariki and Peka Peka beach. 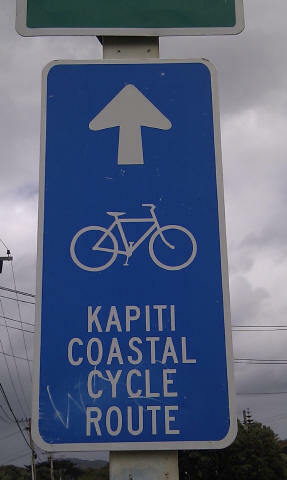 This route is published by the Kapiti City Council and the route is marked with blue signs. The route begins in Paekakariki on Ames Street near Fisherman's Table. Heading north you turn left at the end of Ames St and head up The Parade adjacent to the beach. At the end of The Parade turn right into Henare St and then left in to Queen Elizabeth Park. This is the roughest part for cycling. There are a number of routes through QE II park (the coastal route is probably the easiest), but this does involve a few km of ups and downs on gravel pathways. It is not unduly arduous, but is harder work than cycling along flat roads. Exit at the north end of QE II park to The Esplanade in Raumati South. Turn right in to Poplar Ave for a short distance and then left along Rosetta Road to Raumati Beach. The city council map points out that there are many cafes along the route offering refreshment. Continue north along Matua Road, Marine Parade and Manly Street through Paraparaumu Beach. Manly Street curves right past the Waikanae Scientific Reserve near Waikanae Estuary. Turn left in to Kotuku Drive, then left in to Petrel Close and then along an accessway to Otaihanga Road. Follow Makora Road road to Otaihanga Domain and cross the river on the footbridge (it is polite for cyclists to dismount and walk across the bridge for the benefit of other pedestrians). Turn left and follow the riverbank route past the Waimanu Lagoons and on to the road at Tutere Street. Continue up Tutere Street to the end and right in to Heperi Street, then sharp left and north up William Street for a few hundred metres, and then right on to Rutherford St. This becomes Paetawa Road, which you follow to the end at Peka Peka beach. Near the oxidation ponds the cycle road head left off the road for a few hundred metres on a gravel path past a small clump of pine trees. Paetawa Road is an 80 km/hr speed area. There are plans to continue the route to Otaki (you can head up the beach to Te Horo Beach, and then on to Otaki). Whilst much of this route is on public roads the objective is to keep cyclists off SH1 and the beach roads are generally wide and quiet. The route is essentially flat other than the section through QE II Park. The route is about 25 km one way. The city council suggests that it can be completed in 20 minutes (! ); allow about 2 hours cycling one way. You will meet other cyclists on the route, and there are plenty of cafes and toilet opportunities along the way. When combined with Ara Harakeke and Pukerua Bay coastline you can ride from Mana Railway station to Peka Peka Beach along marked cycle tracks. If you have cycled along Pukerua Bay coastline you need to head up SH1 for a few hundred metres and then left on to Ames Street to join the start of the Kapiti Coast cycleway (the Fisherman's Table is for walkers only). Can join at many locations. End points are Ames St in Paekakariki or Peka Peka Beach. There are railway stations at Paekakariki and Paraparaumu. Public toilets on Marine Parade in Paraparaumu, at Otaihanga Domain, and the start of William Street in Waikanae Beach.